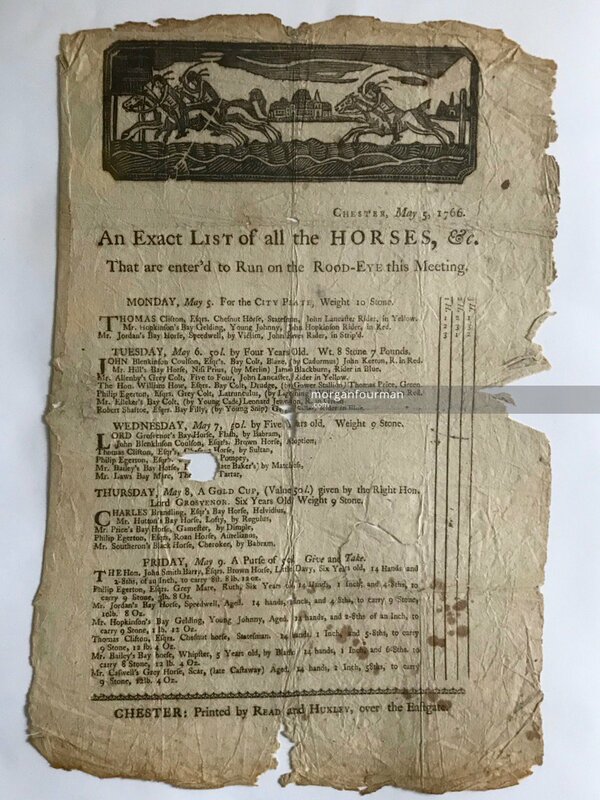 This early Racecard comes from the archive of the Evans family, later of the Red Lion Inn, Wolverhampton. It may have belonged to John Evans. It is evidence of an early interest in horses and a foretaste for the extensive stable kept by the Evans family in Wolverhampton. Later the family were certainly keen sportsmen, but they also required the stable for the major Coaching Inn running the stages from Wednesbury to the Red Lion and on out to Albrighton. Chester Racecourse, known as the Roodee (or Rood-Eye), is one of the oldest racecourses still in use in England. Until 1609 races took place on Shrove Tuesday and thereafter on St George’s Day. In 1766 a May Festival was introduced. The Racecard below is from this meeting. An Exact LIST of all the HORSES, etc. Thomas Clifton, Esqr’s Chestnut Horse, Statesman, John Lancaster Rider, in Yellow. Mr. Hopkinson’s Bay Gelding, Young Johnny, John Hopkinson Rider, in Red. Mr. Jordan’s Bay Horse, Speedwell, by Victim, John Eaves Rider, in Strip’d. John Blenkinson Coulson, Esqr’s Bay Colt, Blaze, (by Cadormus), John Kerton, R. in Red. Mr. Hill’s Bay Horse, Nisi Prius, (by Merlin), James Blackburn, Rider in Blue. Mr. Allenby’s Grey Colt, Five to Four, John Lancaster, Rider in Yellow. The Hon. William How, Efqr’s Bay Colt, Drudge, (by Gower Stallion), Thomas Price, Green. Philip Egerton, Esqr’s Grey Colt, Latrunculus, (by Lightning), William Stringer, Rider in Red. Mr. Elleker’s Bay Colt, (by Young Cade), Leonard Jewerson, R. in Green. Robert Shastoe, Esqr’s Bay Filly, (by Young Snip), […], Rider in Blue. Lord Grosvenor’s Bay Horse, Flash, by Babram. John Blenkinson Coulson, Esqr’s Brown Horse, Adoption. Thomas Clifton, Esqr’s Chestnut Horse, by Sultan. Philip Egerton, Esqr’s […], by Pompey. Mr. Bailey’s Bay Horse, […], by Matchess. Mr. Laws Bay Mare, […], by Tartar. Charles Brandling, Esqr’s Bay Horse, Helvidius. Mr. Hutton’s Bay Horse, Lofty, by Regulus. Mr. Price’s Bay Horse, Gamester, by Dimple. Philip Egerton, Esqr’s Roan Horse, Aurelianus. Mr. Southeron’s Black Horse, Cherokee, by Babram. The Hon. John Smith Barry, Esqr’s Brown Horse, Little Davy, Six Years old, 14 Hands and 2/8ths of an Inch, to carry 8 ft. 8 lb. 12 oz. Philip Egerton, Esqr’s Grey Mare, Ruth, Six Years old, 14 hands, 1 Inch, and 4/8ths, to carry 9 Stone, 3 1b. 8 oz. Mr. Jordan’s Bay Horse, Speedwell, Aged, 14 hands, 1 Inch, and 4/8ths, to carry 9 Stone, 10 lb. 8 oz. Mr. Hopkinson’s Bay Gelding, Young Johnny, Aged, 14 hands, and 2/8ths of an Inch, to carry 9 Stone, 1 lb. 12 oz. Thomas Clifton, Esqr’s Chestnut Horse, Statesman, 14 hands, 1 Inch, and 5/8ths, to carry 9 Stone, 12 lb. 4 oz. Mr. Bailey’s Bay Horse, Whipster, 5 Years old, by Blank, 14 hands, 1 Inch, and 6/8ths, to carry 8 Stone, 12 lb. 4 oz. Mr. Caswell’s Grey Horse, Scar, (late Castaway) Aged, 14 hands, 1 Inch, 5/8ths, to carry 9 Stone, 12 lb. 4 oz. CHESTER: Printed by Read and Huxley, over the Eastgate.